Background: Laparoscopic surgery has been shown to decrease systemic stress compared to open abdominal surgery. One of the mechanisms to explain this finding is the effect of carbon dioxide (CO2) as an insufflation gas. Previous studies have shown that peritoneal exposure to CO2 results in a suppressed inflammatory response compared to air exposure. With the revolution of natural orifice translumenal endoscopic surgery (NOTES), the question of insufflation gas choice has re-risen. 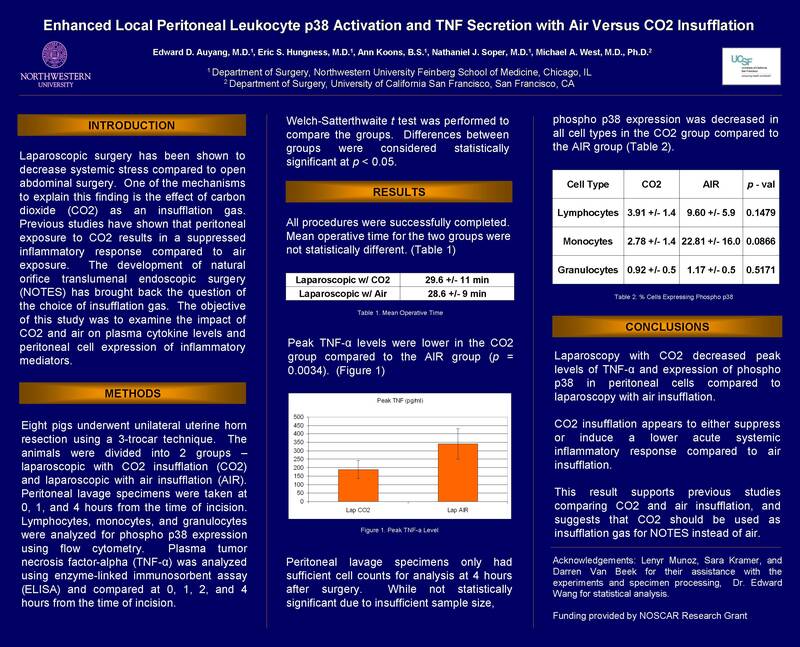 The objective of this study was to examine the impact of CO2 and air on plasma cytokine levels and peritoneal cell expression of inflammatory mediators. Methods: Eight pigs underwent unilateral uterine horn resection using a 3-trocar technique. The animals were divided into 2 groups – laparoscopic with CO2 insufflation (CO2) and laparoscopic with air insufflation (AIR). Peritoneal lavage specimens were taken at 0, 1, and 4 hours from the time of incision. Lymphocytes, monocytes, and granulocytes were analyzed for phospho p38 expression using flow cytometry. Plasma tumor necrosis factor-alpha (TNF-á) was analyzed using enzyme-linked immunosorbent assay (ELISA) and compared at 0, 1, 2, and 4 hours from the time of incision. Welch-Satterthwaite t test was performed to compare the groups. Differences between groups were considered statistically significant at p < 0.05. Results: Peak TNF-á levels were lower in the CO2 group compared to the AIR group (p = 0.0034). Peritoneal lavage specimens only had sufficient cell counts for analysis at 4 hours after surgery. While not statistically significant due to insufficient sample size, phospho p38 expression was decreased in all cell types in the CO2 group compared to the AIR group (Table 1). Conclusions: Laparoscopy with CO2 appears to result in decreased acute systemic inflammatory response in the forms of decreased levels of TNF-á and decreased expression of phospho p38 in peritoneal cells compared to AIR. This is consistent with previously reported results comparing the CO2 and air insufflation, and suggests that CO2 should be used for insufflation for NOTES instead of air.